There are a few things we liked about Swanson Saffron Extract. First off, the capsules are vegetarian, making them accessible to most people. 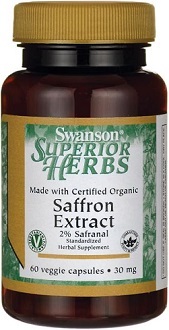 Today we review Swanson Saffron Extract. 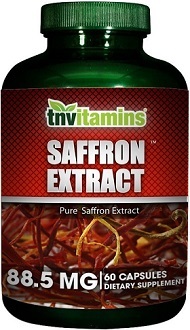 This supplement is made with organic saffron extract and helps to promote mood enhancement. The vegetarian formula allows everyone to take this supplement and experience more happiness throughout their day. Each capsule contains 30 mg of Certified Organic Saffron Extract (Crocus sativus) 2%. This is a very small percentage as well as a very small amount of saffron extract in each capsule. 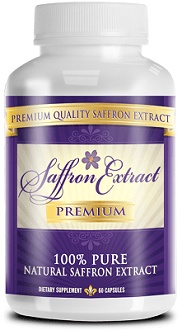 Almost all of the other saffron supplements we have seen on the market have much higher amounts of saffron in each capsule. The capsules themselves are made out of organic oat bran, pullulan, and maltodextrin, making this capsule friendly for vegetarians. The manufacturer recommends taking one capsule one to two times per day before eating a meal. Even by taking two capsules per day, you will still be under the amount of saffron extract found in even one capsule of other saffron supplements. We are worried that the low dosage in this product will decrease its overall effectiveness. The manufacturer’s suggested retail price is $22.99, but by purchasing on the website, this product typically costs $16.99. Right now, the manufacturer is offering a sale to get one 60-count bottle for only $10.84. They also offer many different discounts and coupons to bring the price of this product lower. Free shipping is available on order over $50. With the discounts offered on the already low price, this also concerns us about this product. Saffron is one of the most expensive herbs on the market, and such a cheap price of a supplement makes us wonder how good this supplement truly is. Not only does this manufacturer not have a money back guarantee on its products, their return policy is very small and strict. If you are unsatisfied with the product, you are only allotted 30 days to request a refund and ship your product back. Many supplements take a few weeks to a couple of months to build up in your system before you see the full effect. Such a short time period for refunds does not give customers a long enough time to truly test the product. Customers are not able to see the full effects of this supplement and will not be able to tell whether it will help improve their mood. There are a few things we liked about Swanson Saffron Extract. First off, the capsules are vegetarian, making them accessible to most people. Secondly, the only ingredient is saffron, making this a pure supplement. Unfortunately, there are many things that raised our concern over this supplement. 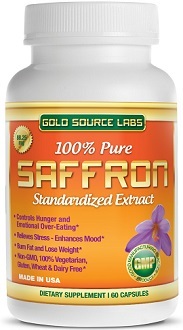 While the only ingredient is saffron, the amount of saffron in this product is the lowest amount we have seen when compared to other saffron supplements. Also, the price being so low is worrisome when you compare it to the actual price of saffron. Lastly, there is no money-back guarantee offered and you are only able to request a refund within 30 days of your purchase. For these reasons, we cannot recommend this product for the improvement of your mood.